Presented to you in this article and collection of videos are some basic lessons on waxing your waxless cross-country skis. I prefer to use the term “functional” when describing my style of waxing because I aim for function rather than high-performance. I cross-country ski for enjoyment, exploration, and exercise (not racing), so my skis are essentially tools for adventure. However, those tools need to be maintained, and learning to wax them is one of the most important ways in which to accomplish this. The effort and supplies required to achieve functional or good enough results versus perfection when waxing skis is far less, which translates to more time on skis and less time in the wax room or garage. If you haven’t read my introduction yet, please do so in order to gain some more insight about my approach to waxing waxless cross-country skis. Again, this wax lesson centers on functional waxing waxless cross-country skis (that feature a standard fish scale-type pattern), so most of what I describe is straightforward and streamlined and shouldn’t take long to complete. For example, so long as my tools and supplies aren’t buried in the back of my storage shed it usually only takes me between 10-15 minutes to wax a pair of skis. But even when just waxing for function, though, there are some principles you should follow. Everything you do to prepare your cross-country skis should support forward movement (i.e. the primary direction of travel). Consistently work your skis from tip to tail so that all the fibers of the base lay down in line with the direction of movement. Although it’s OK to occasionally scrape or brush your skis back and forth in a linear movement (parallel with the skis), always finish with strokes that run from the tip to the tail of the ski. Never move your tools laterally (perpendicular) across the base of the ski or in a circular motion. Use an iron specifically designed for use in ski waxing applications and use it at the correct temperature (for your glide wax). Don’t use a regular household iron when waxing your skis because they don’t maintain a consistent temperatures and most don’t have any type of temperature gauge (just low, medium, and high). Also, don’t set the iron to a temperature hotter than the wax requires otherwise you will cause the wax to burn and smoke. And, be sure to work in a well-ventilated area. Stick with one manufacturer’s line of wax. Additives used in one brand of wax might affect another brand’s performance. Don’t apply traditional (block) glide wax directly to the scale pattern. Do, however, brush the scale pattern when cleaning the bases. Then either apply a thin layer of liquid or paste wax (i.e. Swix F4) to the scales, or just brush over the pattern when brushing free the excess (new) wax. If left untreated, the scale pattern will dry out like the rest of the base and cause snow to collect in the kick zone. Only use brushes specifically designed for use in ski waxing applications. They should be purchased at a store that sells cross-country skis and/or cross-country ski equipment. Don’t buy your waxing tools and supplies at a hardware store. Clean the base and open up the structure by brushing out old wax, dirt and debris, and oxidized fibers. With the bronze brush (or steel if the bases are exceptionally nasty), clean the base by brushing the ski from tip to tail a few times. Use a fair amount of pressure when brushing. Also brush over the scale pattern to clean it out. Please note that If your classic skis feature “skins” or are “zeros” or have anything other than a standard fish scale pattern do not brush this area. During this step, if you were waxing for performance, you might go as far as to scrape free the top layer of P-Tex from the base using a metal scraper, or have the bases stoneground. Either one of these options would definitively remove old oxidized fibers and dirt, and expose or “open up” the base’s structure. For today’s purposes, though, we are not going to do this or discuss it any further because that process is way above my paygrade. Just keep it simple and give your skis a few quality brushstrokes from tip to tail so that they’re more accepting of the fresh wax that’s to come. Increase glide by applying temperature appropriate wax for the snow conditions, as well as to “moisturize” and protect the base. The packaging of glide wax will feature both a temperature range in which the wax will work optimally (in snow), as well as the temperature required to melt the wax (with the iron). Heed both of these pieces of information when applying the wax. There are two main ways in which to apply wax to the base of a cross-country ski. They are the crayoning technique and drip method. The crayoning technique is safer (for the ski) and more economical than the drip method. The reason crayoning wax to the base of the ski is more safe is because the layer of wax acts as a barrier between the hot iron and the base of the ski. The reason it’s more economical is because you can apply the wax in a more controlled manner. The primary criticism (and legitimate reason) that the drip method is unsafe for the ski is that at some point the heated surface of the iron will come in direct contact with the base of the ski (i.e. the places that aren’t covered with drops of wax). This means there’s a risk of the iron searing the base of the ski and causing the structure to melt into a nonporous surface. Remember that relationship between structure and suction I wrote about in the introduction to this lesson? Theories and risks aside, I’ve used the drip method for years and have never burned a ski. This may be a result of living at Lake Tahoe where the outside temperatures never get cold enough to necessitate a really cold-rated wax (which requires a really hot iron to apply). That, and I’m diligent about moving the iron around quickly so as not to linger in any one spot for too long. Interestingly, a co-worker of mine who has been cross-country skiing for decades and is a fantastic instructor as well as a wax tech, described to me one of his past experiments. He attempted to burn the base of a (broken) ski by holding an iron set at its highest temperature directly on the base for a prolonged amount of time. In spite of his devious efforts, he was unable to find any evidence of melted plastic. So, who knows? To apply glide wax using either method, begin by setting the iron to the appropriate temperature for the glide wax of which you are about to apply. For the crayoning technique, hold the iron above the ski and quickly press the block of wax to the iron’s heated surface. Immediately rub the slightly melted portion of the block of wax onto the ski’s base. This will create a crayon-type smear of wax over the base. Repeat this process until you’ve adequately covered the tips and tails of your skis. For the drip method, hold the iron directly above the ski and press the block of wax to the iron’s heated surface. Hold the wax to the heated surface until it begins to drip. Then quickly move up and down the base of the ski (tips and tails only!) to create a uniform spatter pattern of wax drops. After you’ve crayoned or dripped the glide wax onto the tips and tails, quickly run the iron over the wax to create a uniform surface of wax. Don’t forget to heat a bead of wax down the groove of the ski. When you’re satisfied that the wax has been thoroughly applied to all areas of the tips and tails, set the skis aside to cool down. Keep in mind that one wax doesn’t always cover the day’s forecasted temperature range, so I’ll occasionally apply two different temperature range waxes (i.e. red and purple). Although there are a gazillion theories on how to layer and combine wax, I find it easiest to just use the drip method. Again, I try to keep it simple so I can get out and ski that much sooner. One factor to consider when applying two temperature waxes is that one will require a hotter iron than the other. So when you apply the softer (for warmer conditions) wax, be careful to avoid burning it and/or causing it to smoke. I just turn the iron down to the lowest temperature that will still melt the colder wax, then work quickly to avoid any burning or smoking of the warmer wax. Another note is that once the second ski has been set aside, some people prefer to scrape the first ski’s groove (followed by scraping the groove of the second ski) because the wax is still warm. This is fine, but only scrape the groove, not the entire ski. The rest of the wax needs to set for a little longer to maximize the amount of penetration the wax achieves into the structure and base fibers. In fact, some people will re-iron the tips and tails a couple more times to ensure that the base warms up and absorbs as much of the wax as possible. As you might imagine, I don’t do this. I do it one time and then get out there and ski! Clear out the groove and scrape free as much of the newly applied wax as possible. Begin the process of scraping the wax from the base of your ski by starting with the groove (unless you’ve already done that!). Use the groove cleaning tool to accomplish this. Since the diameter of the groove and cleaning tool are often different, you’ll probably have to make a few passes to clean the wax completely from the groove. Scrape from tip to tail, and do whatever’s necessary to get those bits trapped in either ends of the groove. Once you’ve cleaned the groove, grab your flat plastic scraper tool and check that the sides are flat and the edges are sharp. If the edges are dull, caked with old wax, or lined with nicks and burrs, run the scraper over a metal file or sheet of sandpaper to correct it. Just be sure to create perfectly flat planes and 90 degree corners as this will ensure the cleanest possible scraping action. A trick to creating flat planes and 90 degree corners is to hold the scraper next to a small block (wood, book, sturdy box) so that the plane of the scraper (in contact with the file or sandpaper) is perpendicular to your choice of sharpening implement. When scraping the base of the ski, hold the scraper at an acute angle to the ski (angle faces the tail). Apply a fair amount of pressure to scrape the wax from the base, moving from tip to tail. Be especially careful when scraping the very ends of the tips and tails because they can be delicate. Ensure both ends are supported by the wax profile and not dangling beyond its edges. Paying attention to the details when scraping will make brushing (next step) the ski that much easier. 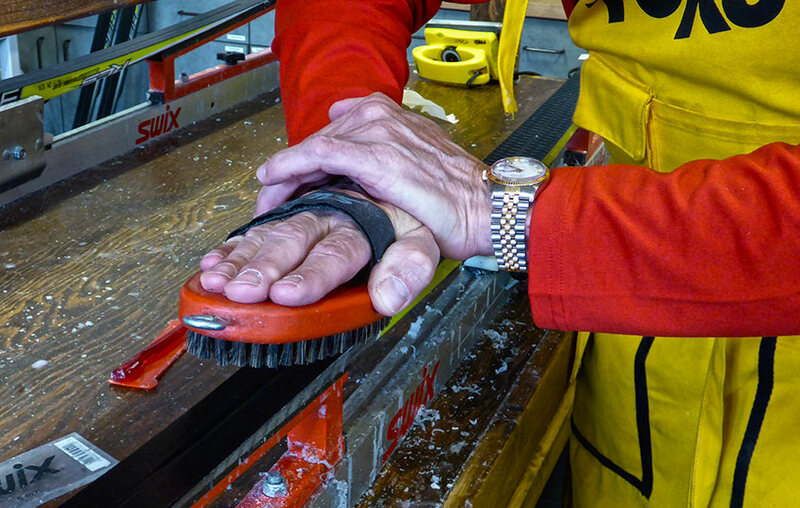 This may require you to scrape at some different angles or even flex the scraper slightly, especially if the base of the ski is anything other than perfectly flat. Sometimes the edges of the skis wear down quicker because they’re used to stop the ski (snowplowing and hockey stops). Other times the ski slightly warps due to being stored in too hot of a location during the summer. There’s a million different reasons for why the base of a ski might not remain perfectly flat during its lifetime, but ultimately you just want to make sure you scrape away as much of the wax as possible during this step. Also know that some people prefer to put their body behind the scraper and push it from tip to tail, whereas others (like myself) prefer to pull the scraper toward themselves (still beginning at the tip and moving toward the tail). I’ve heard arguments for both approaches and neither are compelling. Do what you need to do in order to scrape the ski thoroughly and quickly. Brush free as much of the remaining wax from the base to create a high-buff shine and silky black sheen. Start with a bronze brush and be fairly aggressive with it when brushing off the remaining wax. You ultimately want to leave the least amount of wax that will still cover every fiber of the base. This accomplishes two goals. The first is that (assuming you’ve used the appropriate temperature-rated wax for the snow conditions) you’ll achieve the ideal amount of friction that creates the bead-like layer of water over which you’ll glide. The second goal is to reveal the maximum amount of structure so as to minimize suction. If you don’t brush the ski enough, all the excess wax that remains will clog up the structure and create the nonporous surface I discussed previously. You can feel confident you’ve used the bronze brush enough when you no longer see small particles of wax appearing with each stroke. At this point, switch to the softer nylon finishing brush and give the base a few good brushstrokes from tip to tail. If your ski is outfitted with a traditional fish scale pattern, make sure to brush over it a number of times using both the bronze and softer nylon brushes. As I mentioned earlier, this will help to prevent snow from clumping and collecting in the kick zone of your ski. Additionally, you could apply a thin coat of liquid or paste wax, such as Swix brand F4, to the scale pattern. 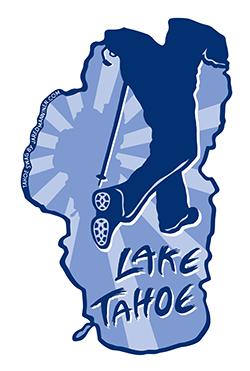 At Lake Tahoe we often suffer in the spring from “Sierra cement,” which is wet, humid snow that has great sticking power. In spite of my efforts to treat the scale pattern of my cross-country skis, snow invariably starts to stick to it as the temperature rises. At a groomed ski resort, this isn’t that big of a deal, but when it happens miles into the backcountry I’d be lying if I said I didn’t start to stress out a little bit. Remove that first ski from the wax bench, wipe off any particles from the sidewalls and top sheet, and then put it aside while you finish the second ski. When you’ve completed both skis, clean up your work station and go cross-country skiing! As you can see, you don’t need a ton of gear to perform the basic maintenance behind waxing your skis, but there definitely are costs associated with purchasing the necessary equipment. My recommendations provide the least amount of waxing gear in order to achieve the maximum (basic) waxing experience. However, based on this article and its introduction, you may find that the most prudent and cost effective course of action to maintain your skis is to either pay a professional to wax them for you, or to just buy a block of all-purpose ski wax and use the public wax room at your nearest cross-country ski area (often they’ll have loaner tools that everyone can use). The elephant in the room with regard to buying gear for yourself is the wax profile. This is clearly a large and specialized piece of gear that might be cost and space prohibitive. However, they’re invaluable to the cross-country ski waxing experience and pretty much a requirement since there are no good alternatives to adequately supporting your skis when scraping and brushing them. If you do decide to invest money into your own wax kit, again, buy your equipment from stores and shops that actually sell cross-country ski gear. Don’t try to cut costs by buying this stuff from a hardware store. You will regret it. Choose a local ski shop near you from which to purchase the items, if at all possible. Otherwise, Gear West and Tognar offer a wide selection of tools, and their prices are competitive. I realize that to many beginner and hobbyist cross-country skiers, this whole process may seem excessive or unnecessary. Why bother when I can just run some liquid wax over the ski and be on my way? This is a totally legitimate question, and I know many people who do this. I will even do this on occasion, but in the end all those quick wax options are just half-measures. It’s like tossing five bucks in your gas tank everyday rather than just spending a few more minutes to fill the thing up. There are no hard and fast rules as to how often you need to wax your skis, but when the bases start to look white and ashen it’s definitely time. I generally wax my skis after 3-5 times of use (whether or not they look like they need it—they do need it!) and I brush them with the bronze brush after each use. Even just brushing the skis with a bronze brush that has a bunch of wax still stuck in its bristles is better than nothing. I would argue that it’s even better than using a quick wax, considering that both applications are just a one-time use anyway. And, if you’re only cross-country skiing a few times during the winter you may only need to invest in a one-time full wax job. The long and the short of it is that you do need to wax your waxless cross-country skis. By waxing them, you will prolong their lives and have a consistently more enjoyable and safer experience.